It’s always a crapshoot, moving to a different residence and then accommodating overnight guests for the first time. As a host, you have to wonder: Is the bed comfortable? Is the room cool/warm enough? Did I remember to put that extra roll of toilet paper in the bathroom? In the aftermath of The Daughter’s visit, during which The Son-in-Law was here for the last four nights, the answers are: not especially, yes, yes, and—for a question that hadn’t occured to me—the improperly-installed shower door leaked water all over the guest bathroom floor. But who can fret too much about such trifles when there’s homemade ice cream? In this part of Texas, it’s been a warmish summer. Twenty-eight days so far of 100°F or higher, and we still have six weeks to go until fall. Such heat demands (screams for!) ice cream. But not from the grocery store, or from any specialty ice cream shop. No, I’ll make my own, thanks. Why bother? Because it’s so good it leaves store-bought ice cream melting on the sidewalk. 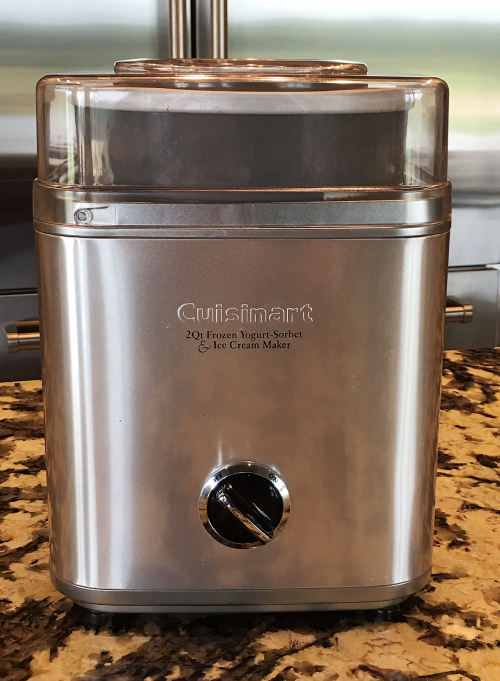 A machine like my Cuisinart here (one of Cuisinart’s more basic models) makes ice cream quickly (in about 25 minutes) and easily, and requires no ice or salt. It has a removable cream can that I store in the back of my freezer so that I’m always ready to take on ice cream emergencies. (Which arise more often than you might think.) With this machine in my pantry, I can walk right by the frozen foods section at the grocery store. And continue on my way to the wine section. 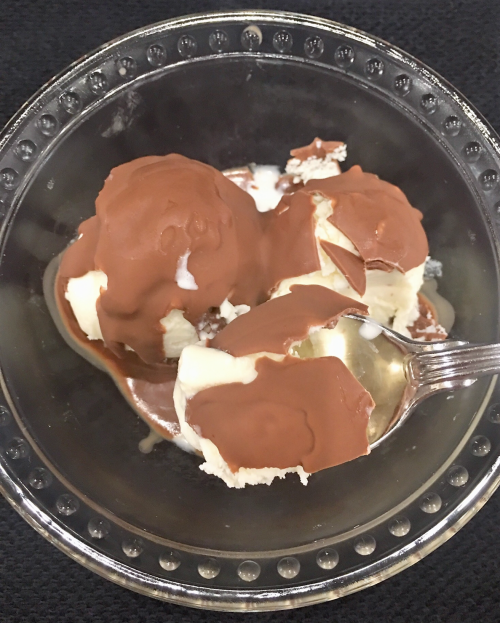 Stir all together until thoroughly blended and pour into the cream can of your ice cream maker. Process according to manufacturer’s instructions, then transfer to a suitable container and finish hardening the ice cream in the freezer. 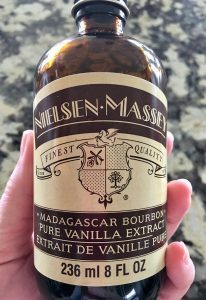 Makes a bit more than 1 ½ quarts. First: Toast ½ c. pecan pieces (broken-up halves) in a 350° oven for about 7-8 minutes, until fragrant. Remove from oven and allow to cool. 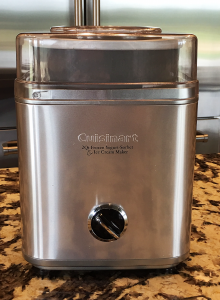 Continue processing for the last few minutes, then transfer to a suitable container and finish hardening the ice cream in the freezer. Makes a bit more than 1 ½ quarts. It’s the same with ice cream. 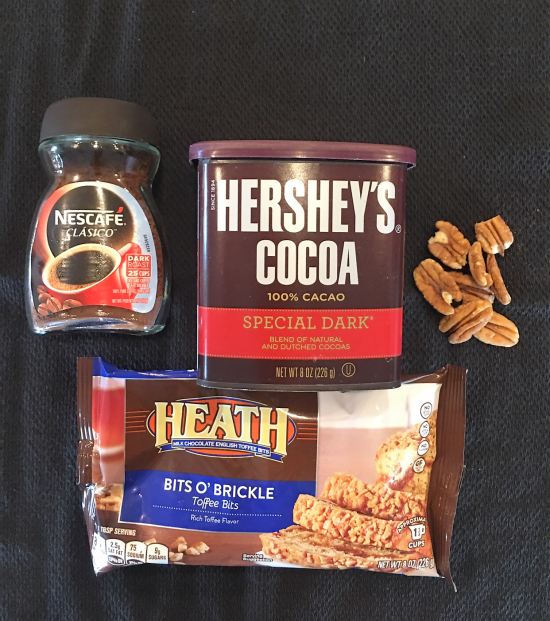 In the Chocolate Pecan Brickle recipe, even just switching from Hershey’s Special Dark Cocoa to the regular stuff and subbing macadamias for the pecans will yield something very different but equally delicious. Factor in toppings (salted caramel!) and the possibilities boggle the mind. Katie and Wesley are back in Colorado now. We had a wonderful time, despite their less-than-comfortable bed and the leaky shower door. Glen and I miss them terribly already. But we know they’ll be back. I said I’d make ice cream. 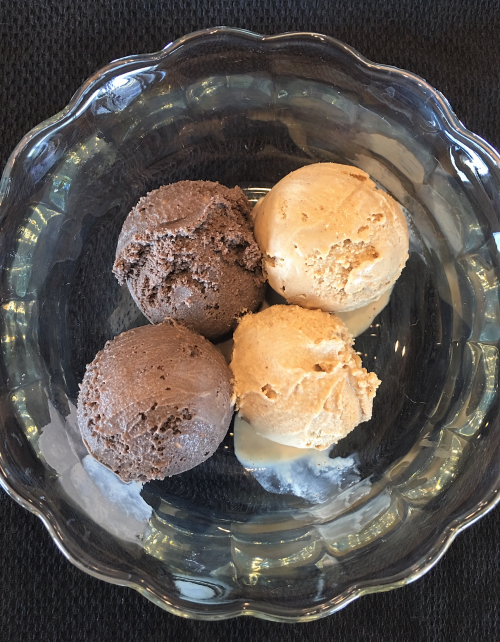 Chocolate Pecan Brickle left, Coffee Cinnamon right. Enjoy!